Behind the scenes of NBA All-Star Weekend: Parties, Kobe salutes, freezing-cold temperatures and the best All-Star Saturday ever. TORONTO — On the way to the Air Canada Centre on Sunday night, there was a group of four or five women in big puffy coats and unreasonably short skirts. They must have been waiting to get into the stadium, but now they were 15 feet past the line. They were all warming their legs by kicking their heels up against a giant heating vent on the side of the stadium. The defining image of All-Star Weekend in Toronto is either Aaron Gordon going beneath his legs over the mascot, or those women and the heating vent. I can't decide. But it was all great. The best part of All-Star Weekend is that you see things that could only take place at All-Star Weekend. Sometimes this means an eight–part handshake between James Harden and Clint Capela. Sometimes it's Elfrid Payton watching a virtual reality painter sponsored by Mountain Dew. Sometimes it's Steve Nash's girlfriend picking his nose on the JumboTron while the crowd applauds Olivia Wilde and Jason Sudeikis. This weekend takes everyone from the most ridiculous professional sports league on Earth and throws them into one place for one 72–hour sprint. I was talking to Stephen Curry about it Sunday morning, and he explained, "The sleep is definitely on the backburner. We can sleep on Monday." And now it's Monday. So before the NBA goes to sleep, let's look back. 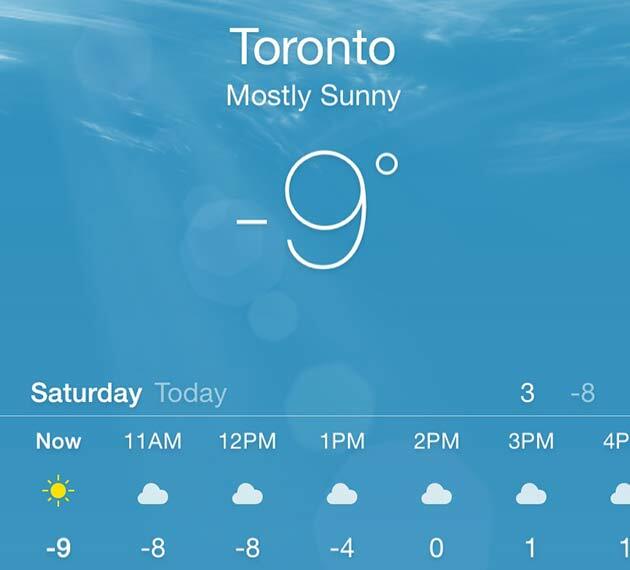 Here are a few of the most memorable scenes from 72 hours in subzero Toronto. "He followed his stellar career at Bethel High School..." Rick Kamla was saying as I walked into the press conference. "... He was the first player chosen in the 1996 NBA draft..."
I'm not sure I'm ready to see Allen Iverson inducted into the Hall of Fame (and me inducted into old age), but it's happening. For Shaq, Yao Ming, and Iverson, Friday's press conference was the first step to the inevitable—whether that be the Hall of Fame this summer, or the eventual irrelevance of the generation that treated Iverson's crossover on Tyronn Lue as a religious experience. But none of that mattered a few minutes later, because as the press conference concluded, everyone crowded the stage, and there was someone wearing a Blue Chips varsity jacket. Then he turned around, and ... IS THAT TONY? "Yessir," said actor Anthony C. Hall, who played Tony in Blue Chips. He passed TV. He graduated from Western U. And he made it into Shaq's press conference to celebrate the Big Diesel's legacy. "Me and Shaquille have been best friends since before we shot Blue Chips. We met through Magic Johnson," he explained. "Playing at UCLA during the summers. That was the year before we did the movie. And we've just been best friends ever since." I asked for his favorite memory from the set. "The games were bananas," he said. "We set up 15 cameras, and we just played. Everything you saw was just us playing. And everybody was playing. Penny, Hurley, Calbert Cheaney... It was nothing better." Hall played college basketball at Chaminade in Hawaii before landing in L.A. and linking up with Shaq. Now they're all going to Springfield. And did Hall ever shave points in real life? "No way. Never shaved points at Chaminade, because Merv Lopes wouldn't have it." Does Tony feel old seeing all this? "No! I'm just proud of my best friend. We just came from China. But this right here is bigger than anything." Please remember: Iverson and Shaq are going to Springfield, and taking our youth with them. But that means Tony is going to Springfield, too. This is ultimately a generational victory. Adam Silver just had a conversation, on stage at the Tech Summit, with a convincing, talking, full-sized hologram of James Naismith. This might be the closest thing the NBA has to an annual Illuminati meeting. Next to the party LeBron and Drake threw Saturday night, the NBA's annual technology summit was easily the toughest ticket of any event this weekend. It's all strictly off the record, and it features agents, owners, CEOs, and everyone else who pulls the strings around the league—except for LeBron and Drake, at least. I missed the hologram of James Naismith, but I found my way in for the final few hours. Without going into specifics from the panels—again, off the record—there are new cameras being developed that could one day allow you to pause the game and rotate your view to anywhere on the court. (Basically, this Aaron Gordon Vine, but with your remote.) There are video games that will soon be able to let you enter a Slam Dunk Contest in 360-degree virtual reality. It's all very cool and Conan-ish. But the most interesting questions come from the technology that's outpacing our understanding of how to use it. There is more data to analyze than ever before—the phrase of the day was definitely Big Data—and processors can now handle it much faster than even a few years ago. But while that makes for razor–sharp clarity and reams of information for teams, just as often, it means getting hung up on some obscure data point that can lead a team to talk itself out of good ideas or good players. It's the signal and the noise question Nate Silver wrote about in 2013, except the noise is getting louder with each passing year. And if that paragraph feels like a lot to process, then... welcome to the Illuminati meeting! Please, More Parties in L.A​. It was below zero almost all day Saturday, and the windchill was just this Michael Irvin tweet. "Yes, it's a bit cold here," Adam Silver said Saturday night in his annual State of the Union address to media. "But I've been reading up on James Naismith, Dr. James Naismith, who, of course, was born in this very province of Ontario." Gotta prepare for the hologram conversation. "And what I read is when [Naismith] founded this game 125 years ago, it was because he thought there was an activity needed to keep young boys, young men active on these very cold winter days. And of course, he planned it as an indoor activity. So when I keep hearing about how cold it is, I keep reminding people that's true, but our events are inside, so no big deal and we're all enjoying it here." Silver was smiling throughout, and it was met with laughs all around. That's pretty much the attitude that everyone had all weekend. But that does not mean the cold was funny. I skipped the D-League All-Star Festivities—Jimmer's MVP! Three-Point Contest history!—because I couldn't feel my ears anymore on Saturday afternoon. Others made similar decisions all weekend long. Toronto was fantastic once you got inside. Likewise, the fans were better Saturday night than any All-Star crowd I've ever seen. Having said that, I don't know if I can ever come back here in the month of February. And I don't know why Congress can't mandate that all major sporting events rotate between Miami, New Orleans, and Los Angeles. See? Look at Matthew Dellavedova. Look at Andrew Bogut. Patty Mills. And all of the NBA Australians this weekend. They have the right idea. Speaking of Australians... 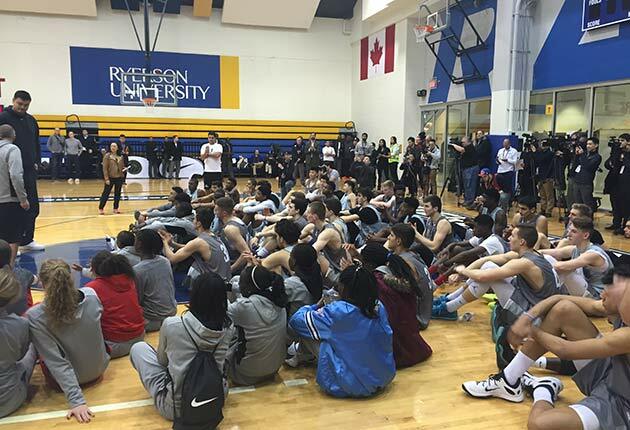 If you were looking for real basketball personnel in Toronto this weekend, they were all at the Basketball Without Borders event, downtown at Ryerson University. This began last year, when the NBA decided to invite a group of the best high school players from around the world to come participate in a three-day camp during All-Star Weekend. With Year 2 in Toronto, it's officially tradition, and a glaring reminder of how large the NBA's machine really is. Along with scouts and GMs from every team, there were players from Europe, South America, Australia, Egypt, Japan and more. Half of them will probably play for the Spurs one day. For now, the biggest name there was Thon Maker, but from what I heard and saw, his game doesn't match the hype. More than anything, watching him play just makes you hate the clickbait headlines that cursed him with unfair Kevin Durant comparisons. On the other side of the spectrum, there was a DeAndre Ayton, a big man who goes to school in Phoenix but hails from the Bahamas. At 17 years old, he's 6'10" and ranked No. 1 in his class. Rebounding and scoring with ease next to the best teenagers Europe has to offer, it's easy to see why. If you were looking for real basketball personnel in Toronto, they were NOT at the Mountain Dew Pop-Up Art Gallery/Nightclub that I visited after the Basketball Without Borders event. At one point, I took this note: "Bizarro Kelly Olynyk is using virtual reality MS Paint to make Russell Westbrook in outer space, Elfrid Payton is here, there's Biggie blasting, there's an open bar of Mountain Dew." That is the brand experience at All-Star Weekend in one sentence. I was there to help produce a Westbrook video. While he denied that his blood is pure Mountain Dew, he did make it clear that the Thunder can beat the Warriors in seven games. Also, given that he got married last summer, I asked Russ for his number one piece of wedding advice. His answer: "Listen. Listen to whatever she has to say." Westbrook is A) correct and B) now my fiance's favorite player. The NBA can't start again until Kevin Hart and Draymond Green settle this with overtime. I just signed a letter of intent to Kentucky. Everything delivered on Saturday. Adding big men to the Skills Competition was the perfect way to revive an event that's always been a little bit disappointing. Kevin Hart pushing Draymond to the brink was so surprising that the NBA had to pretend he lost just to stay on schedule for TNT. Stephen Curry, Klay Thompson, J.J. Redick and Baby Devin Booker all helped deliver in the Three-Point Contest. Dikembe Mutombo and Jon Stewart were doing the Nae Nae. There was even a kid's Dunk Contest in the arena, hotly contested between Lil CP3—caught an alley-oop from Kevin Hart—and Carmelo's son, Kiyan, who won by teaming up with Odell Beckham, Jr. for a mailman dunk and subsequent dab. And, obviously, the Dunk Contest delivered. In retrospect, it's actually great that the event was so deflating for the first 20 minutes. There were drawn out introductions that killed the mood. Everyone was missing dunks and making the crowd anxious. The dunks that landed had been done before. We had all the ingredients for the most depressing Dunk Contest ever. Deep down, that's probably what everyone expected. Instead, it only set us up for more delirium when things got fun. First, Zach LaVine reminded people that he can do this all night, every year, and everyone woke up. And then Aaron Gordon showed up and put it all over the top. What's your favorite part of the Dunk Contest? The dunks themselves? The mounting tension when two guys are going head to head? The sound of the crowd? The convulsions from players on the sidelines? Saturday had everything. It was freezing cold outside, Kobe, Durant, LeBron all skipped the festivities, and none of it mattered. I can't wait for 10 years from now when I'm writing an overly-emotional tribute to Saturday night in Toronto. 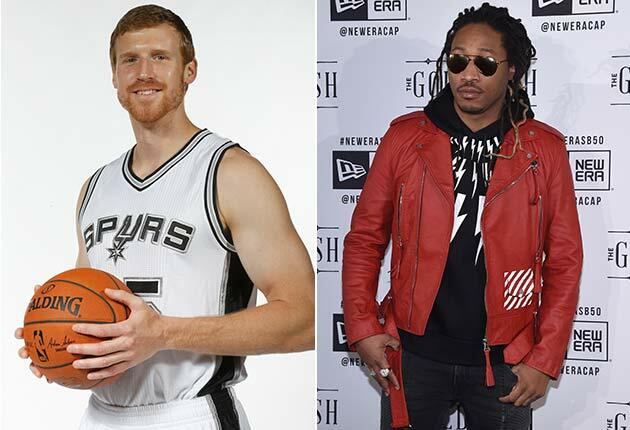 On Friday night, there was the annual All-Star party hosted by the Bonner brothers. This was my first time, and it was as much fun as any party I've been to, mostly because it actually felt like a party. Most All-Star events go hard for the club vibe, and everyone is trying to play it cool and impress everyone. This party was in Lee's Palace, an alternative music club—like Toronto's version of the 9:30 Club—and was pretty close to the polar opposite of "club vibe". Girl Talk performed, the main floor turned into a sweaty mess, and it was all great. Of course, the other side of the spectrum is also still great. Saturday night was the NBAPA party, and in addition to John Wall, Chris Paul, and Tyronn Lue, there was Future, an army of non-All-Stars and retired stars like Antoine Walker and Jerry Stackhouse. Good parties can happen anywhere. But only at All-Star Weekend will you see Charlie Villanueva posted up in the front row shooting selfies with Future. My first question for Steph Curry on Sunday morning was simple: Does he realize how crazy all of this is? Three years ago he was snubbed as an All-Star altogether, and now he's the center of the NBA universe. "The platform, and the rise... The people who support me and what I do on the floor, or are inspired by the stuff we've been able to accomplish—that's the surreal part." Your kids are famous now, I interjected. "Yeah... that," he laughed. "That doesn't make any sense... But the winning, the championship and now to be part of this crazy, historic season. All that stuff has been building for a while. You don't think it would be this astronomical, with the 48–4 record and all that. But from the time I was snubbed three years ago to now, I'm working the same. Maybe working a little smarter, but my approach to the game is the exact same." Curry was made available while promoting a new iPhone app called Slyce. It's designed to make social media easier for pro athletes, and he helped found it with Bryant Barr, a former teammate from Davidson. And he can do things like "try to invent a new social media model for famous people", because like LeBron before him, anything he touches will force people to pay attention. This is his reality now. We talked more about the season and the weekend. He picked Kobe to win MVP Sunday, "unless I get 30 assists passing to him all night." He promised that Draymond Green would be hearing about Kevin Hart from teammates for the rest of the year. 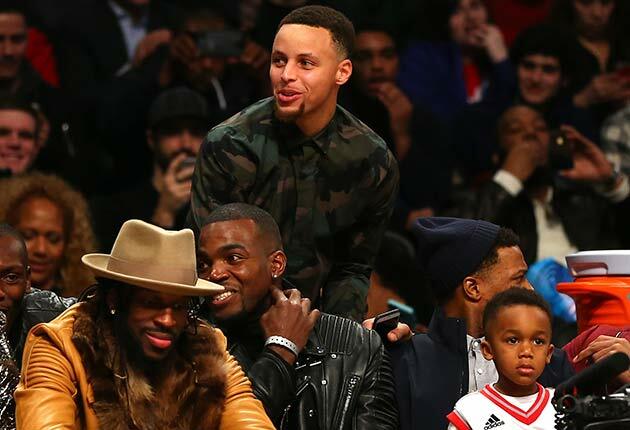 And of all the Frank Lucas comparisons Draymond drew with his fur coat Friday, Curry said, "He sent those photos early to our group text. He knew he had to get out in front of the jokes." In general, your All-Star Curry update is that he remains completely at ease with what's turning into one of the craziest basketball stories of all time. "It's kind of like, you stay in the moment," he said. "Just enjoy every minute of it. I don't know if I've truly grasped how far the reach is with this thing. Because I'm so wrapped up in the process, I can't really separate myself from it. We're still writing the story." I asked him for the best advice he'd gotten this weekend, positive he'd mention Kobe somehow. But there was a long pause. Then: "Literally every coach I've met, from the Spurs [coaching the West] or whoever, every coach I've met this weekend has told me, 'Keep shooting.'" There was already too much said about Kobe on Sunday night. Double video tributes was a bit much, and while the weekend itself delivered, the game fizzled. Ben Golliver captured the vibe perfectly. It was bad and overdone in all the same ways Michael Jordan's last All-Star Game was, except this one didn't even include a Mariah Carey Wizards dress. Thankfully, the least important part of any All-Star celebration is the game. This weekend should be a disaster every year. It should be a cynical exercise in crossover branding, corporate glad-handing, mailed-in performances, over-the-top tributes, and an assault on your senses that leaves you numb, like spending too much time in a really loud mall. Objectively, that's pretty much what it is. 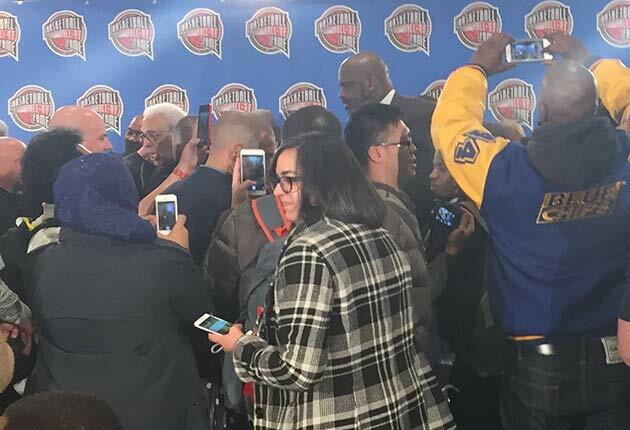 But aside from the general chaos and hilarity, my favorite part of All-Star Weekend is watching all these generations come together. For people who watch and write and work and play, it's like a basketball family reunion, and the new torches get passed each year. Iverson goes into the Hall of Fame, and Russell Westbrook wins a second straight All-Star MVP. Kobe gets the emotional introductions while D'Angelo Russell and Jordan Clarkson snicker through questions about Byron Scott. Bill Russell and Oscar Robertson sit courtside, and LeBron makes room on the bench for Dwyane Wade's kids. The NBA is the most entertaining sport in America. It's got the best highlights, the funniest moments, the most vivid characters, and as much drama as any other sport. But it's worth loving for the people. This year, the celebrations were supposed to be for Kobe, Shaq, Yao, and Iverson. But anyone who watched will remember Zach LaVine, Aaron Gordon, KAT, Wiggins, and Westbrook. Even Gregg Popovich enjoyed it. 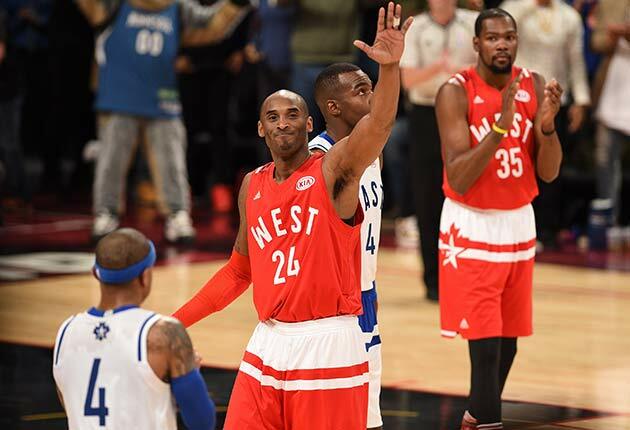 "It's the most fun I've ever had at an All-Star Game," he said Sunday night. "Just because of the predominant group of the young talented kids coming up... Watching them interact with each other was a thrill." Now it's Monday, though. Time to sleep.